Bioethics is somewhat unusual in the philosophical world in that things tend to happen fast. New evidence and new biomedical technologies emerge daily, and all of these developments demand careful thought and reflection to figure out what they should mean for ethics and policies in health care and health research. Indeed, the rapidly changing landscape of evidence and practices in medicine is part of what makes this such an exciting area in which to work and teach. It was thus with great interest that I read the (September 28, 2015) post here at Daily Nous about Turing Pharmaceuticals and their (arguably) unethical drug pricing scheme. Pharmacoeconomics is not (yet) a topic of mainstream philosophical concern, and it was therefore truly exciting to see it featured and discussed for such a wide philosophical audience. Since I am co-teaching (with Dr. Rebecca Li) the Introduction to Research Ethics course at Harvard Medical School’s newly-launched Master of Bioethics Program—and since part of training in bioethics is learning how to engage and contribute to the ongoing, public debates that concern health care and medicine—the discussion at Daily Nous also gave me an idea: As an optional assignment, I asked the students to write a short response to one (or more) of the entries from the Daily Nous post. I also reached out to Justin, who graciously agreed to publish their responses en bloc. What follows are the essays of the six students who took on this assignment. Many thanks to them, and many thanks to Justin for providing this forum and opportunity. In her commentary, Danielle Wenner points to a structural inequality in healthcare, which gives greater bargaining ability to those in a position of power—in this case, Mr. Shkreli, the CEO of Turing Pharmaceuticals. Implementing additional rules and regulations to govern these transactions, as Wenner suggests, may do something to level the playing field, but this approach places an undue emphasis on the transactional dynamic between merchant and consumer, which fails to account for the additional economic pressures at play. Indeed, as I will argue, manufacturer pricing—however tempting a target—obscures a deeper inequalities in our healthcare system between the patient and the institutions of health-delivery. But let’s begin with Wenner: She correctly observes that Mr. Shkreli undoubtedly has a bargaining advantage when it comes to Daraprim. However, in setting the price at what the market will bear, has he breached a moral obligation to his customers? He may simply may be exploiting the dynamics of a free market, and Turing is just one of a number of drug manufacturers pursuing similar strategies. This is consistent with Wenner’s account of drug manufacturers who simply provide a product that is in customer demand. If healthcare transactions were as simple as a bargaining arrangement between manufacturer and consumer, then perhaps Wenner’s worries about the power imbalance would be appropriate. Unfortunately, the realities of drug pricing and payment are far more complicated than this. For example, according to one assessment of the typical cancer financial “bill,” only 24% of the cost is due to the chemotherapy itself. The remainder sits with facility services and physician fees. In advanced cancer settings, the average 6-month spending in 2011 between acute hospital care and drug costs was nearly a 200% difference ($16,953 vs $5,705). This gulf between the cost of healthcare services and drugs grows even larger when factoring in diagnostics, outpatient procedures, hospice, home health, medical equipment and other categories. Thus, Lee Newcomer, an executive at UnitedHealthcare, argues that the true “misbalance of power,” exists between patients and their physicians, their hospitals, and their insurance companies—institutions with an explicit moral obligations to their patients and customers (in contrast to the pharmaceutical manufacturers). Once these institutions are brought to the bargaining table, it is now less obvious that the transaction is unfair. Consider the efforts of Sloan-Kettering Memorial, who in 2012 made headlines and gained nationwide praise for refusing to provide a new cancer drug, Zaltrap, because it was too expensive. Sloan-Kettering’s leadership argued that the value of the drug, as measured by its clinical efficacy, was not commensurate with its price tag. As a result of the decision, the manufacturer promptly discounted its product by 50%. Jeffrey Gruenglas is a senior vice president at The Access Group, a life sciences management consulting and communications firm. Chris MacDonald points out that there is no clear theory of just pricing, and hence we should be very careful at judging extreme price hikes. He proposes several models, including that drug pricing should be determined by patient need and the duty of beneficence, tempered by considerations of distributive justice, or perhaps restricted on the grounds of non-exploitation. Yet he finds none of these to be satisfactory. He argues that beneficence is too weak and that drug companies are already often engaging in at least some charitable activities. Justice is also unsatisfactory because, given many other extant injustices, it is not clear that ad hoc adjustments in drug pricing will effectively promote social justice. Finally, he finds non-exploitation questionable since the “exploited” patient is still substantially better off than if the drug company had not come alone. Thus, he concludes that rather than examining fairness at the level of individual drug price hikes, one must look at the entire health care system. However, I think there is another way forward, which focuses on the moral obligations of our regulatory system: The current system of drug regulation is designed to incentivize pharmaceutical companies, such as Turing, to develop and then supply society with life-saving products—i.e., goods with the power to prevent harm. Part of the justification for drug regulation is therefore rooted in a moral obligation to prevent harm, while promoting social value through innovation and improvements in health-care. Thus, the regulatory body, as the moral agent, needs to strike an optimal balance between its prima facie duty of harm-prevention and its prima facie duty to promote social value. The public response to price gouging and Turing Pharmaceuticals suggests that the regulators and lawmakers need to re-think the present balance. Busi Mombaur is a neurologist. Marcel Verweij concluded his Daily Nous post with the following statement: “Monopolist pharmaceutical companies that force a democratic society to pay for the innovations they see fit undermine justice in health care.” As plausible as this statement may seem on its face, it contains some problematic assumptions that should be examined more closely. For one, it is too strong to claim that “society” is being forced to pay for the Daraprim price hike. At least in the US, we operate within a (largely) private health care system, where individual patients and/or their health insurance companies are required to pay for treatments. Were we to have a universal health care system that was funded by taxpayer dollars, it would then be more reasonable to claim that society as a whole is unjustly burdened by the sudden increased price of Daraprim. However, since this is not the health-care model in US, then it seems that at least a first pass of the ethical analysis ought to focus on those individuals who need, and must now pay more for, Daraprim. Arguably, this is a major source of the outrage over this case: It is specifically not society-writ-large that is suddenly being forced to pay, but rather a particularly vulnerable sub-ground of patients. Yet, perhaps the more problematic assumption is that idea that patients are “forced” to pay higher prices for Daraprim. While on the one hand, I sympathize with this sentiment; on the other hand, I do not think this conclusion is so straightforward. Do we owe these patients this treatment? Are all patients entitled to medication for their existing conditions and potential illnesses? If the answer to these questions is, “Yes,” then this seems to imply that anything short of universal health coverage is morally problematic and unjust. That is a very strong assumption—in need of a strong argument—and clearly at odds with the reality and present justification of healthcare in the US. Given the reality of market-based care, I think the basis on which we can criticize companies like Turing or CEOs like Shkreli is more limited than Verweij suggests. We are not owed treatment and we also do not have regulatory systems in place in the US to control treatment costs (as many other countries do). One might even argue that since society-writ-large can absolutely afford to let these patients die, then this sort of pricing is perfectly legitimate in the context of market-based health care. If we find that consequence unacceptable, then perhaps this ought to be a modus tollens of market-based health care, and the lesson of the Turing price-hike is the need to adopt universal health coverage. Danish Zaidi holds a Bachelor of Arts from Georgetown University and, along with his study in bioethics, is completing his Master of Theological Studies from Harvard Divinity School. A number of commentators have observed a fundamental difficulty in analyzing the Turing price-hike: Mr. Shkreli has broken no law and only proposed to charge “what the market will bear” for Daraprim. Since CEOs are not bound by the same moral obligations as health-care providers—such as beneficence or justice—this makes it challenging to determine exactly what is wrong with this action. While I cannot hope to dissolve this difficulty, I would like to contribute to this discussion in two ways: first, by illustrating the particular vulnerability of the patient population that is effected by the Daraprim price-hike; and second, by observing that the same logic underlying the Orphan Drug Act, which offers economic incentives to companies to develop treatments for rare or otherwise unprofitable diseases, could be extended to protect these vulnerable populations post-approval. The patient population most directly affected by Turing’s pricing are HIV-positive patients. The HIV virus decreases the ability to fight infection by destroying the body’s T-cells. When the T-cell count is less than 200/microliter and the patient has an opportunistic infection, the patient is said to have “AIDS”. At this stage, the patient becomes extremely vulnerable to toxoplasmosis, a parasitic organism that infects the brain. The clinical manifestations of this condition include fever, head ache, seizures, hemiparesis (inability to move ½ of your body), and aphasia (inability to speak). If untreated, toxoplasmosis can lead to brain swelling, coma, and then death. The recommended treatment includes 6 weeks of Daraprim, along with two other drugs, the total cost of which would be around $32,000. This is in addition to the cost of potentially life-long treatment for HIV and AIDS, which is estimated to cost up to $40,000 per year. It is estimated that there is 1.5 million HIV infected individuals in North America with over 1 million cases of AIDS having been diagnosed. HIV positivity and transmission is most common in minorities and pockets of poverty in both urban and rural regions, which are patient populations that often lack basic health care and insurance coverage. Therefore, in analyzing the moral justification and legal ramifications of the Daraprim price-hike, it is important to recognize that it disproportionately effects this already-vulnerable population. It is also important to recognize that there is an existing precedent for regulators and lawmakers to intervene and correct these apparent injustices. The Orphan Drug Act was originally passed in 1983 to assist in the development of therapeutic pharmaceuticals for rare diseases. Through defraying cost from the developers to incentivize production, rare diseases could be treated at a reasonable cost to consumers. Although toxoplasmosis is in itself not a rare disease, the treatment for central nervous system toxoplasmosis in the AIDS population is, arguably, vulnerable to the same lack of economic incentives for development as a more typical “orphan disease”. Thus, it seems to me that this same logic could be applied—and legislation could be extended—to make Daraprim (or similar drugs) more accessible. Sergio Salazar is a physician educator at the University of Central Florida. As Samia Hurst points out, “rather than guaranteeing access [to drugs],” the Turing price-hike “seems designed to limit it.” And yet, Turing’s actions are perfectly legal and by no means a unique occurrence. Why does price gouging keep happening? Following Danielle Wenner, we can explain this pattern, in part, by the potential power imbalance between the patient-consumer, who needs to buy a particular medication, and the manufacturer, who can charge what the market will bear for that medication. However, the patient-consumer is not necessarily powerless in this situation. Indeed, if the recent ALS Ice Bucket Challenge—which raised $41.8 million in donations for the ALS Association—has taught us anything, it’s that mobile apps coupled to focused activism can be a conduit for social expression, education, and economic power. Now imagine if similar social-media mechanisms could be leveraged to mount clever campaigns against pharmaceutical price gouging. It could even be something as simple as “Yelp for Pharma”. For example, Jennifer Miller has described a rating system that would assign an “ethics score” to companies. Her current system rates individual pharma companies based on five primary criteria: (i) clinical trial design; (ii) clinical trial conduct; (iii) communication of clinical trial data; (iv) drug marketing; and (v) access. The access category could plausibly be expanded to include price hikes as obstacles to “access,” offering a penalty score that is proportional to the size of the price increase. If the hike were obscene (as in the Turing case), then this particular parameter could be weighted accordingly to ensure that companies couldn’t hope to score well (overall) with only 4/5 criteria. Moreover, as Hurst asserts, “it is very clear that any effort involved in developing [Daraprim] has long been paid for and that any further profit cannot be deserved in this way. Manufacturing it still costs money, of course, but nowhere near enough to justify its current cost.” To address this point, the scale above can be modified accordingly for drugs like Daraprim to more heavily weight issues of access, ongoing manufacturing and customer relations—and possibly also marketing strategies—rather than the full 5-part scale, which is more relevant to the production/testing of a new drug. Were such a rating system widely adopted—and ideally put into a mobile app platform—this would empower the consumer-patient not only distributing the latest pharma rankings but also by facilitating information-sharing across patient communities. Once companies realize that patients care about the rankings and that they affect purchasing decisions, then pharma will have an incentive to change. Juan J. Carmona has a PhD in cell and developmental biology and an MPH in family and community health. Controversy over exorbitant drug prices is not new, neither are stories of companies acquiring a monopoly on a drug then imposing a significant price increase. So why has the story of Daraprim attracted so much attention? As Samia Hurst points out, this is not an isolated case. And while I agree with her that the examples that draw the most attention tend to be the ones in which the prices are raised the highest, this case does have something special about it: Martin Shkreli. In contrast to the pharmaceutical corporations, which prefer to remain faceless, Shkreli has put his face front and center in this story. He is a former hedge fund manager with a history that includes accusations of illegally manipulating stock prices. He was ousted from a previous pharmaceutical company that he founded and is currently being sued for $65 million by that same company. Shkreli’s history and the subsequent assumptions that we make about him because of his history is the key to this discussion. His history leads many to assume that his intent behind Daraprim’s price increase is solely profit driven, and not for the benefit of patients or research, as he claims. This case is an example of why intention matters. It is this intent that makes this case seem so egregious. 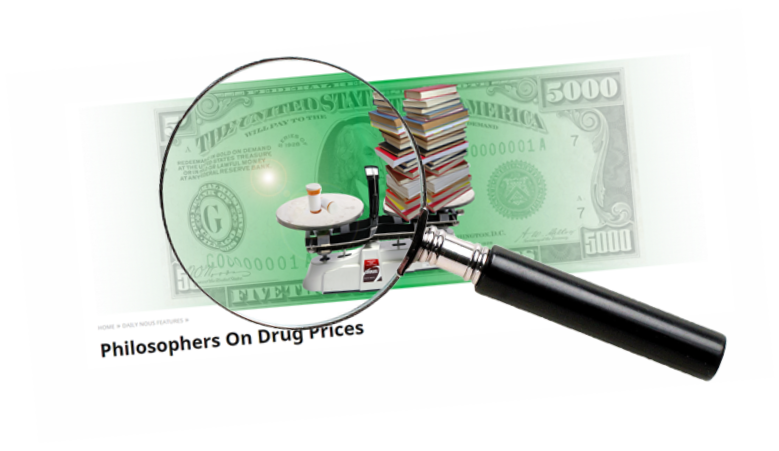 Pharmaceutical companies with a history of drug research and development are often given the benefit of the doubt when it comes to their high drug prices. I agree with Hurst that we “approve this profit because we believe that the effort and creativity involved in bringing a new drug to the market also deserves to be paid for.” When a drug’s price may be high, the public does not typically react the way it has in the case of Daraprim. One can argue that while most drug companies have a duty to their shareholders and is therefore profit driven, it is claimed that a significant goal of higher prices is to fund drug research. Whether that is actually true is less relevant than the fact that we hope that most drug companies’ intent is one partly influenced by values that drive further research, therefore helping patients. With Martin Shkreli however, because we know something of his history, we assume that he is driven simply by profit. Thus, he is exploiting patients who have no other option and exploiting a system that is not designed to keep costs down—pure and simple. Hurst seems to think that this case is striking because the price increase is clearly not related to drug development costs. She’s correct, but she seems unwilling to cast blame where it is due. So who is to blame here? Is it Martin Shkreli and his obvious greed or is it the system that allows his greed to rear its ugly head? The answer is both, but in this case, the public has focused on Shkreli because he has made himself such an easy target. If he was someone with a track record of altruism, perhaps we would see him differently. Unfortunately, his television interviews, in which he tries to justify the price of Daraprim, failed miserably (at least in terms of public relations) and he came away looking like the greedy profiteer that many of us believe him to be. At the end of September, Shkreli announced that in light of all of the controversy he would lower Daraprim’s price. After his announcement, much of the outcry died down, but telephone calls to some local pharmacies several weeks later confirmed that the price of Daraprim was still over $700 per pill. That is why, when Imprimis, a San Diego based pharmaceutical company, announced at the end of October, that they would be producing an alternative to Daraprim for only $1 per pill, several colleagues and I cheered. Nevertheless, all of this controversy and bad press does not appear to have hurt Turing Pharmaceuticals much. They are currently hiring and list a number of job openings on their website. Someone should probably let them know that what they really need is an ethicist. Jill Garland has a Master of Medical Science degree from the Yale School of Medicine and is a physician assistant in the section of Trauma, Burns and Critical Care at the Bridgeport Hospital in Bridgeport, Connecticut.